With the news of Ringside coming out from Image in a couple of months, I thought I'd look at another comic about professional wrestling. 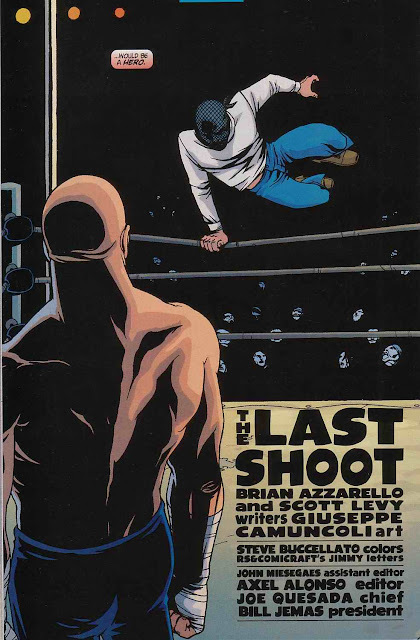 So here I am looking at my copy of Spider-Man's Tangled Web #14, by Brian Azzarello, Scott Levy, and Giuseppe Camuncoli, published in 2002, and wondering if readers who don't watch professional wrestling understand it. 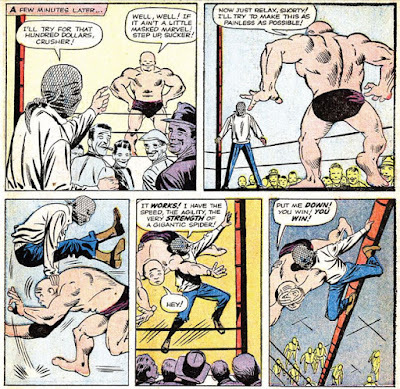 "The Last Shoot" is the story of Crusher Hogan, who is the professional wrestler that Peter Parker fights in his first appearance in Amazing Fantasy #15, way way back in 1962, to test out his powers. 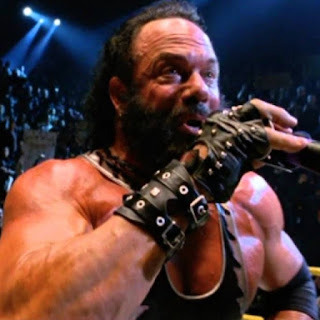 In the first Spider-Man movie, he was renamed Bonesaw McGraw and was played by Macho Man Randy Savage. RIP Macho. You were awesome. "The Last Shoot" tells the story of Crusher right before his meeting with Spider-Man and, consequently, shows how Spider-Man is responsible for ruining Crusher's life without even realizing it. Now I'm a pro wrestling fan, so I understood what was going on right away, as I am used to pro wrestling words such as "kayfabe," "angle," and "shoot," and I think this story is easily understandable by non-pro wrestling fans as well. But for those who don't get it, here I am to explain it to you. Okay, so "The Last Shoot" opens with Crusher Hogan in the ring, establishing that he's what's known as a shooter, someone who can hurt people for real. "Shoot" means they're doing it for real, as opposed to "work," which is when they're playing a character. You can do a "worked shoot," in which you're in character, but you're grounded in the reality of the situation. In this case, we find out why Crusher's really rough on his colleague there. The guy wasn't selling (making it look like the moves hurt), so Crusher actually hurt him for real. Selling is an important part of any match, since it makes the opponent look strong. So Crusher has a warning for the kid for next time. had a young up-and-comer named Chris Masters not selling well enough for the Undertaker. After repeated warnings to sell better, the Undertaker broke his arm in the ring. Unfortunately, the company Crusher works for, Championship, isn't doing well and even his boss Bobby thinks that jumping to the competitor, Global, is the best thing for his career. Crusher's wife Marie says "They just want a piece of you," and it's in those words that Crusher finds his gimmick. The next show, he shoots... on the fans. Worked shoots have such strong appeal in pro wrestling — CM Punk's whole career turned around once he delivered his famous "pipe bomb" promo, which people I know who know wrestling is scripted thought was real. It got them to pay attention after a long while and brought the WWE into a new era where they bring the characters into their social media accounts and blurred the lines between kayfabe (the world in which the characters live) and the real world. Whatever Crusher said must have been really convincing, because it sells out the next show. The next thing we see is Crusher loaning money out from Hammerhead, who demands it back the day after the show, with interest. This is the part that doesn't really fit. If Crusher was sure he wasn't going to use the money, why didn't he just pad a suitcase full of random paper and then a top layer of bills? Ah whatever, it adds to the tragedy. The next scene features a sold out crowd and the same longhaired wrestler Crusher was working with at the beginning of the story thanking him for doing this for them. This is something that fascinates me about pro wrestling: the better the main eventer does, the better the entire promotion does, so it's really about filling the correct roles and knowing when to step aside and when to step up, because the more money for the promotion means more money for everyone. 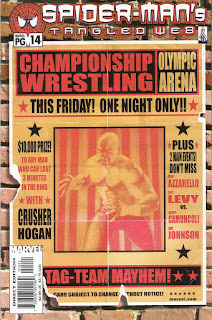 It's here that Crusher reveals his plan: 10,000 dollars to anyone who can last three minutes in the ring with him. It's an ingenious plan that hinges on Crusher's complete confidence in his ability to shootfight. 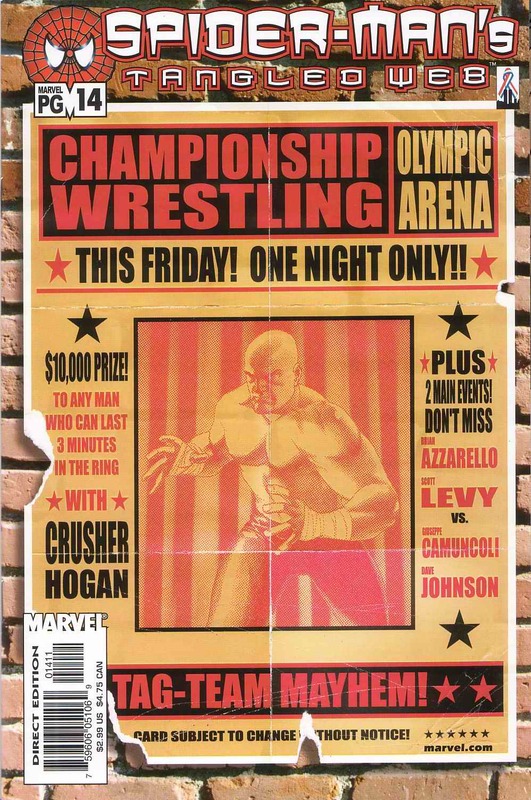 The cash incentive would always ensure a sellout crowd, and those who don't give it a try will always tune in to see who beats Crusher, because that guy would become a hero. It's even an angle with an easy way out: when it's getting stale, they can just plant the next planned main eventer in the crowd and have him beat Crusher. But it's an angle that needs time to gain traction. It has to have time to build up, and Crusher needs to get a bunch of wins in a bunch of nights to really make the fans hate him and for any payoff to mean anything. Unfortunately, for Crusher, that very same night, this happens. Keep in mind that at no point in the story does it say this is happening in the past, so until Crusher reveals his gimmick, it could easily have been taking place in the present day. 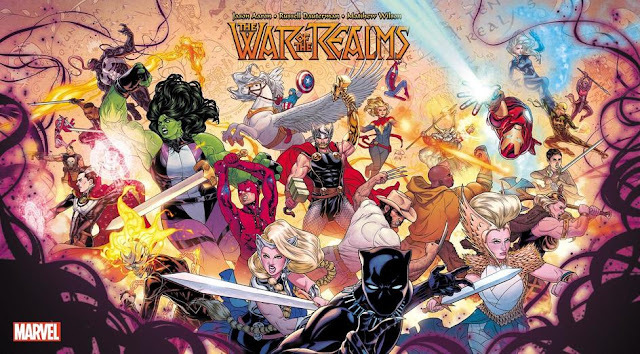 When Spider-Man makes his appearance, the impact is heightened. We know what happens next. 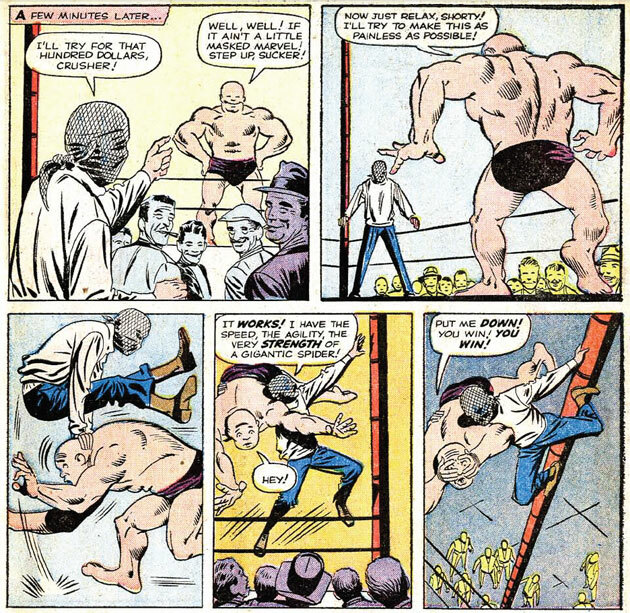 Crusher's career is over, he owes 11,500 dollars to Hammerhead, and Peter Parker is completely unaware of it. But Crusher's not resentful at all, no, because the next time Crusher is seen in continuity is in Amazing Spider-Man #271 (published in 1985), where Crusher is working as a janitor who tries telling people that he trained Spider-Man. He lives alone in a New York apartment that I doubt he could actually afford (just like in Friends), and is, apparently, actually a big fan of Spider-Man. So you know, Spider-Man ruined the dude's job, marriage, and life, but it's nice to see Crusher didn't hold any grudges! "The Last Shoot" delved pretty deeply into the wrestling world, and as a fan, I thought that was pretty cool. 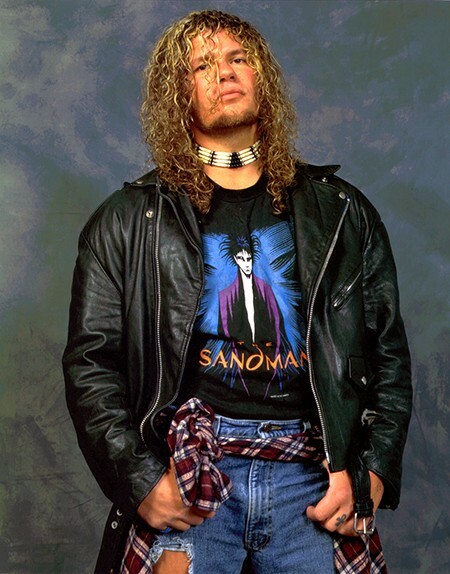 Another cool thing about it for me is that co-writer Scott Levy is better known as the professional wrestler, Raven, who has never made his being a fan of comics a secret.